You’ve definitely seen them all over Instagram. Everyone from beauty influencers to A-list celebs have taken to their Insta accounts to rave about jade rollers. These pretty little beauty tools are made from jade (of course) and are supposed to decrease under-eye puffiness, calm inflammation, and even smooth fine lines. Jade rollers have been used in China for beauty purposes for centuries, and maybe even millennia. So they’re definitely not a fad, but they are having their big social media moment now. Are they worth trying out though, or are they just another over-hyped beauty product? We asked a few of our CB experts to weigh in on the jade roller craze. Do jade rollers actually work? Esthetician Jordana Mattioli tells us that she’s seen some far-fetched claims for rollers, but she does believe they have some real benefits. They “help to stimulate the lymphatic system and circulation, from the massaging that happens during the rolling,” she says. “This can help with inflammation and fluid retention.” According to Jordana, these massaging motions can also “relieve tension and relax the muscles in the face.” She believes in the positive power of touch for overall wellbeing, and says she’s “all for a facial massage any time—whether it’s with your hands or a roller. 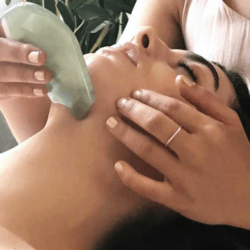 We also talked to esthetician Christina Biscardi, who is curious about trying a jade roller herself. But she’s not totally onboard with all that they claim to do. “I believe that the best use of a jade roller is to reduce the puffiness under the eyes,” she tells us. She’ll also concede that it might be a temporary fix for fine lines, but she wouldn’t recommend a jade roller over a topical product or Botox. “I think it’s a lovely complement to any at-home regimen,” Christina says. “But in my honest opinion, you could get the same results from rolling an ice cube over your face, the same way an athlete seeks muscle tension relief in an ice bath post-game or workout. What’s the best way to use a jade roller? Jordana likes to store her roller in the fridge, since the coolness gives extra anti-inflammatory benefits. (We love that idea!) She tells us that there’s no wrong way to use a jade roller if you’re having a facial relaxation session. But there are certain techniques to follow if you want more of a drainage or contouring effect. Jordana recommends working on one side at a time, starting with the neck and then moving to the face. As for the face, Jordana advises to “do each side of the jaw, rolling outwards from middle of the chin to ear.” Then you should do the side of the nose to the ear, under the eyes, and then the forehead. And repeat on the other side of your face! Last piece of advice? “Take your time and don’t rush it,” Jordana says. Should you be worried about any risks or side effects? Jordana tells us that there are generally no risks involved with jade rollers. “But avoid using it if you have acne or are dealing with any rashes, skin infections, or cold sores,” she adds. Michelle also reminds us to “sanitize your dermal roller with a mild soap and water after every use,” just like with any tool that touches your skin. But she agrees that there’s no reason to be worried about using a jade roller. “There are absolutely no risks,” she says. “Other than [the fact that] it can be a highly addictive beauty ritual, adding a few more minutes to your regime each morning!” A small sacrifice for glowing skin, right? Christina Biscardi answered a reader’s question about what to use for under-eye bags. Plus: the best eye creams to combat fine lines.